A glance at the calendar, a look at the rehearsal schedule, the buzz of activity in the shop and suddenly it’s upon us. Only three weeks remain until opening night. Assistant Stage Manager Hannah makes notes. The rehearsal schedule is the most telling document. It is laid out in columns and shows the date, where, time, what the actors will be working on and who needs to be there. Up until now the what column says things like “Block Act 1, scenes 1, 2, and 3.” One group of actors needs to be there for the first hour and another group needs to be there for the second hour to block a different set of scenes. But starting tomorrow the who column simply reads “ALL”. Notations in the time column say “LONG DAY” which is highlighted and adds a Friday rehearsal on July 1st before one last three day weekend for the actors. The what column says “Run Act 1” or “Run Act 2”. The choreography, the singing, the choir are starting to take on more importance as they are woven into the scenes. Blocking on the High School stage. The pit band started rehearsing this past week still without an accordionist. Choir Director Julie (seated at piano) works with a group of singers. The shop crew remains in full swing as the set pieces need to be ready by July 5th. Even so, the painting and decorating will be going on while the rehearsals are running. On Saturday morning Tevye’s house sat out on the stage and a crew of three continued working on the details, a tape measure sat on the window ledge. At 10 a.m. the three drifted out of the auditorium over to the choir room to rehearse while the backstage crew continued working in the wings, the shop and, since it was a nice day, outside. Work on the train station, the butcher shop, the tailor shop, the inn, and the well progressed. There is so much left to do as the time to do it fades–props, costumes, lights, sound all start to add the subtle layers. The audience very seldom notices these unless something goes horribly awry–costume malfunction, an uncooperative light, or a dead microphone pack. No matter how much planning goes on, no matter the amount of preparation and double checking, Murphy’s law can and will prevail. All the parts and pieces are finally starting to come together as the urgency picks up and by the end of this week the production will reach its critical mass. Scott wants everybody to know Wednesday evenings and Saturdays are workdays from now until showtime! Captains, rally your villagers and get them to the shop! Scott’s idea was simple and brilliant–let the people of Anatevka build their village. The cover sheet of the audition package was clear, if you got a part, you would be expected to help out with the set construction. Not only that, you would be assigned to help out on one of the major set pieces, specifically the one that the characters would inhabit during the play. The actors of Tevye’s family would help build and decorate Tevye’s house; Lazar the Butcher, in charge of the Butcher Shop; and so on. So here’s how it turned out. 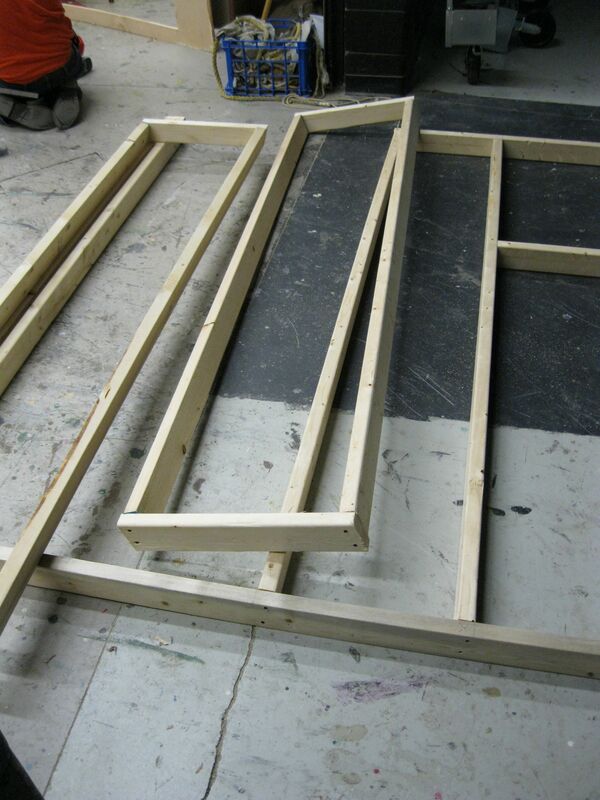 Master Carpenter Bob and Set Tech Monica build the frames. Bob, Monica, and Scott bring it together. Zoe, who is afraid of heights. Chris, Andy, Scott, Justine, and Alex looking perplexed. Clark on the importance of drywall screws. The Evansville Community Theatre doesn’t have a home. In fact the only real estate we have is a post office box and a couple of storage units, all leased, of course. At times members of the Board long for a building. We could have a rehearsal space, a place to store costumes and props, lumber, and small set pieces. (I can hear Melissa, who has been kind enough to make her basement an ECT storage space, say “amen” to that.) And if the building had its own theatre we could even stage some of our smaller productions there. Since no large bags of money have dropped out of the sky, nor are there any in the forecast, we have to work with what we have. And what we have is the old, small, aging Middle School Auditorium (MSA), and the beautiful, new, large, gorgeous and well appointed High School Performing Arts Center (PAC). Because of the timing of the summer musical (and there is a lot of thought to that), rehearsals start at the MSA and then, once school is out next week, we’ll move to the PAC. Christa the Director (center, arm outstretched). Both facilities are busy during the last few weeks of school with band and chorus concerts, awards ceremonies, talent shows, and other special events. For a few days there were risers on the stage of the MSA then they disappeared. Now it’s set up for the talent show so it’s mostly clear. Friday night the PAC hosted the High School band concert which was cleared so on Saturday morning the cast of Guys and Dolls could rehearse for their performance for Madison’s Overture Center Tommy Awards. The first few weeks of rehearsals are all about blocking where the director plans how the actors will move about the stage in various scenes. The issue is the MSA is compact with no wings to speak of and a stage about 1/5th the size of the PAC. And the challenge is enhanced with the ever changing stage landscape. The director has to have the vision of how the movements will translate to the large and luxurious PAC stage. The Importance of Being an Eraser: Stage Manager Melissa makes notes. As the director moves her actors, the stage manager madly scribbles notes, in pencil for the time being, as everything is subject to change. Sometimes the director changes her mind before the stage manager has finished the notes in her script. The actors also make their notes in pencil since the scripts have to go back to the publisher and all marks must be erased before we return them. In the end erasers may be even more important than the pointy part of the pencil. While blocking, rehearsing, choreography, and singing continue at the MSA for the next week, everyone waits patiently to move to the PAC and suddenly the tenor of the rehearsals will change as everyone can begin to feel what the director is already envisioning.